So how about a New Year’s Resolution that you’ll want to keep up beyond January, that adds something fun, exciting and rewarding to your life? We’re more fun than going for a run; with a wide range of gigs and events already planned for 2018, your social media posts will be a lot more interesting than a series of RunKeeper stats. We’re more sociable than a box set; as an established and thriving band, you’ll instantly have close to thirty new friends. Our welcoming attitude and an active social diary means “Netflix” will soon drop out of your vocabulary. We’re warmer and drier than a swim in the Serpentine; with Christmas out of the way, brass banding is a strictly indoor activity until the summer! We’re less competitive than Sunday League Football; there are no trials or auditions to get your place on our team. As long as you’re comfortable playing a brass instrument in a group environment, you’re in! We’re less judgmental than a dieting club; no public weighing or body-shaming here. We have a supportive culture where we encourage and learn from each other. Our more experienced players love sharing their expertise to help you improve or get back into playing. We’re cheaper than gym membership; as a member-run, not-for-profit group we have no overheads and keep subscriptions to an absolute minimum. Handy when that January pay-cheque seems so far away. 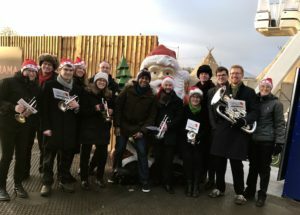 If that’s not enough to persuade you, then take a look at what we’ve been up to in December to get a sense of what it’s like to be a part of Putney and Wimbledon’s local brass band. But if the guilt of that unused instrument is becoming too much to handle, fill in the form below, and there’ll be no more blues in January; only brass band music!